Our firm has attained a renowned place in the industry for presenting Earth Resistance Testing Services. Earth Resistivity Test for finding out Soil Resistivity B.G.L and direction of flow of ground water by Polar-Diagram. The british pendulum skid tester is one of the standard devices used for measuring and monitoring skid resistance on roads, tiles, floor and airfields. In situ testing in various locations, such as, reception areas, canteen, train stations, shopping centers, factory floors, road and car park surface testing. 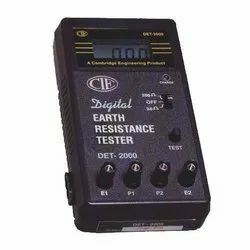 We are the leading service provider of Earth Resistance Testing. Earth Testing covers the testing of earth electrodes and the measurement of soil resistivity. The instrument requirements depend on the range of applications.